We’d love your help. Let us know what’s wrong with this preview of Death of a Batty Genius by Angela Pepper. Stormy agrees, thinking what's the worst that could happen? The resort owner is a world-famous pastry chef, so the biggest danger Stormy Day is making a name for herself in Misty Falls as a private investigator. To ask other readers questions about Death of a Batty Genius, please sign up. I was so happy to receive this third book featuring Stormy Day. She is a great character. Stormy is studying to become a licensed Private Detective and lives with her best friend Jessica. She rents one side of her duplex to Logan Sanderson. Logan after much waiting asks Stormy out and none other than Christopher, Stormy's ex-fiance crashes their date. That was a real mess of a first date. Christopher invites Stormy and Jessica to join him at his cousin's spa for the weekend. They head up and head into the craziest bunch of happenstances imaginable. There are so many unforeseen events that occur that make the story hilarious as well as interesting. Unexpected visitors arrive and wreak havoc on the quiet spa. I laughed at the antics of these guests. They kept me guessing with their thin confessions and alibis. Stormy, Christopher and Jessica work together to unravel this mystery. With all this going on Logan is always on Stormy and my mind. I can't wait to read the fourth book. High on a mountain, cut off by a mudslide, with a murderer running loose... How does our favorite detective get herself into these situations? And more importantly, how will she get herself out of this one? Dive in for Stormy Day's latest adventure, it's well worth the read. Highly recommended. Fast paced, easy to read, witty charactees, and a story line that keeps you on your toes. I'm so happy I stumbled upon this series. Another fabulous storyline. Loved it. This book was different from the other two that I read from the same author, yet still good. We did not have a dead body until almost the end of the book. It seemed very strange for Stormy Day to go through more than half the book without finding a body! Also strange in this book, her ex-boyfriend, Christopher shows up while she is on a date with her new friend Logan! He is acting strange and Logan knocks him out and then drives all of them back to the duplex that he rents from Stormy and takes Ch This book was different from the other two that I read from the same author, yet still good. We did not have a dead body until almost the end of the book. Also strange in this book, her ex-boyfriend, Christopher shows up while she is on a date with her new friend Logan! He is acting strange and Logan knocks him out and then drives all of them back to the duplex that he rents from Stormy and takes Christopher on his side so that she does not have to deal with him. When she gets over to her side of the house, she looks for Jessica, her roommate to tell her about the evening she had, but Jessica is not around. It turns out that Christopher and Jessica both had a smoothie made from tainted Rainforest Delight mix made by someone who grew up in Misty Falls, Oregon and had some good friends still living there along with his aunt and uncle who own the convenience store where Christopher bought the smoothie mix. Since the store is a popular place, many other people bought the mix and were all having strange reactions to the smoothies. Stormy found Jessica up in a tree and had to get the fire department to get her down. The next morning Christopher is finally back to himself and tells the girls that he has a wonderful idea. His cousin, Butch is opening a new Lodge in the mountains of Oregon and has invited all of them to come up for three days to test out the lodge and see if it is all set for the opening. What they do not know is that other guests will be there also. Some of them are also from Misty Falls too. Not known to anyone, Christopher's cousin, Butch is married to one of the four people who are from Misty Falls and the group call themselves, "Geniuses". By the middle of the book, the body of one of the geniuses is found outside and everyone is looking inside to find out who did it. The book is quite different from Stormy's other books, as this one she really was working with the police in Misty Falls and was promised a paycheck. The book was well written and all the facts were good and I enjoyed it! I liked this one. Quite a bit. Which isn't surprising given that I've enjoyed the other books in this series, but I think picking it up at the right time helped. You know what I'm talking about, right? One of those days were you're looking for something lighthearted and fun with a dead body or two (that last part might just be just me, I dunno). Well, Stormy delivers on both the lighthearted and fun AND the dead body. On the downside, we didn't get to see as much Logan this time around. Sad. Burl I liked this one. Quite a bit. Which isn't surprising given that I've enjoyed the other books in this series, but I think picking it up at the right time helped. You know what I'm talking about, right? One of those days were you're looking for something lighthearted and fun with a dead body or two (that last part might just be just me, I dunno). Okay. Enough about my unconscious word associations. Let's get back to the matter at hand. Stormy. Dead body. Trapped away from civilization. I'm going to be blunt, I didn't care for her ex. Almost-werewolf lawyers seem like a much better choice for her and I'm all for them hooking up. So the ex... he didn't do it for me. However, the ex did come in handy during the investigation. So there's that. Ultimately, this book was fun with a side of dead bodies. Well, A dead body. But that doesn't sound as good, does it? Just go with it, man. Just go with it. I think that this story is my favorites out of the three. There was just more-of everything: the plot, the characters, the delivery. Angela just did a wonderful job with this one. If you haven’t read the previous books, Stormy Day is a private investigator after discovering she has a knack for this type of work. In this installment, Stormy is whisked away for a weekend trip with her rommie and bestie Jessica. And she is lured away by none other than her ex-fiancee Christopher. Christopher’s cous I think that this story is my favorites out of the three. There was just more-of everything: the plot, the characters, the delivery. Angela just did a wonderful job with this one. If you haven’t read the previous books, Stormy Day is a private investigator after discovering she has a knack for this type of work. In this installment, Stormy is whisked away for a weekend trip with her rommie and bestie Jessica. And she is lured away by none other than her ex-fiancee Christopher. Christopher’s cousin Bruce is opening up a mountain resort and people are invited to test it out. Now what should be a relaxing weekend turns into one full of danger and mystery. A crime needs to be solved before there are more than one victim. Will Stormy be able to figure out what happened? Stormy is basically on her own in this one. She is far away from the police so she has to deal with the help of Jessica and Christopher. Angela was able to show just how much better Stormy has become at being an investigator. I loved how she was able to figure things out, her thoughts and skills were fascinating. I just felt like this was more of a complete story with the developments. The characters were great and the storyline moved with great pace. I also loved the romantic angle between Stormy and Logan. I was happy with that one. You can’t help but love Stormy. Her personality is wonderful and I can see her as one of my friends. This third in the Stormy Day series takes Stormy and her friend Jessica away from home with Stormy's ex Christopher, but mayhem, banter and murder are on the scene. Another fun story from Angela Pepper, where the characters continue to grow while she takes us on a fast paced ride. I love Stormy and all of her crazy friends plus her cat, Jeffrey. Getting stuck in a resort lodge before opening with people you don’t know and a dead body, is nerve wrecking but Stormy comes through and solves the case! Somebody recommended this series for fans of Stephanie Plum. I really dislike Stephanie Plum, but I enjoy this series a lot. Much better than the 2nd in the series. Back to the giggling out loud moments and a story that makes sense even if it is in an outlandish way. I am so in love with Stormy Day. She is a great character. Keeping me up at night reading as I need to know who did it. Now having read two of the previous book in this series.. i was able to predict the killer by the authors style of setting up the plot. This story takes place away from the mesmerising Misty Falls (which i dearly missed), up in the mountains. The author tried best to keep the plot line twisted but it was so obvious... and I knew who the killer was right after the murder. The third book in the Stormy Day mysteries. I am really enjoying the author Angela Pepper's character of Stormy Day. This was probably my favourite in the series. I love Stormy Day and her quirky friends. This was a wonderfully funny and suspenseful story of a wannabee Detective, Stormy Day, and her ex fiancee, and a small group of friends who find themselves at the scene of a murder at the top of a mountain and at an unopened lodge called the "Flying Squirrel Lodge". 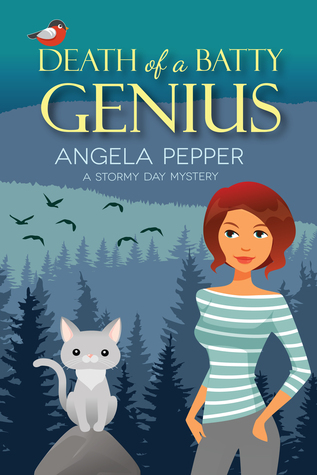 The Author Angela Pepper, writes beautifully, she adds her personal sense of humour and her loves of cats to each of her stories in the Cozy Mysteries Series. There is a touch of romance, with hints of affection between stormy and he This was a wonderfully funny and suspenseful story of a wannabee Detective, Stormy Day, and her ex fiancee, and a small group of friends who find themselves at the scene of a murder at the top of a mountain and at an unopened lodge called the "Flying Squirrel Lodge". 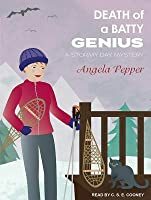 The Author Angela Pepper, writes beautifully, she adds her personal sense of humour and her loves of cats to each of her stories in the Cozy Mysteries Series. There is a touch of romance, with hints of affection between stormy and her tenant Logan. The story includes Karaoke, snowshoeing, extreme winter weather, mudslides and food poisoning. You have to read this story to believe it! This book series is a must read if you love mysteries and great books along the lines of the Stephanie Plum books. This book was gifted by the author for an honest review. This is my favorite book so far in the series. This novel has everything I enjoy in a book - mystery, murder, humor and fun. Stormy must put her private investigator in-training skills to work to solve the mysterious death at the luxury resort she is spending a "restful" few days at with her best friend and ex-fiancé. I was captivated from the very beginning until the last page. This is an enjoyable cozy mystery that will keep you guessing until the very end. And - there is a happy added bonus end This is my favorite book so far in the series. This novel has everything I enjoy in a book - mystery, murder, humor and fun. I was captivated from the very beginning until the last page. This is an enjoyable cozy mystery that will keep you guessing until the very end. And - there is a happy added bonus ending that will just add to the charm of the next book in the series. I enjoyed this mystery with only a small amount of violence in it.. I enjoyed the book and crazy group of Characters. However, I found it difficult at times to keep them straight. I was gifted this book as an advanced copy.This is a good book to read on the beach or on a Winter's night before a fire. It is light and easy reading and gave me many laughs. This was the most uninteresting book in the series so far. The crime came late in the book and wasn't very interesting. The whole book seemed to be aimed to create some sort of romantic tension (which failed in my opinion). I loved the first two books, but this was a disappointment. On to the fourth one with high hopes of it being better again. It was a cozy mystery with a lot more story and less mystery-solving than the previous two books. Unlike the other books, the dead body didn't appear until around the middle of the book. A character or two were less believable than the previous books, but it was still a quick, enjoyable read. I look forward to reading the next one in the series. Stormy Jessica her storeys cat, along with her ex boyfriend head up to a mountain lodge for a preview of the new lodge. Muddle,dead body, and some crazy people lead this story daring you to stop reading. Dare works as you cannot put this book down.. looking forward to the next in this series. Angela Pepper lives with her family in the rainy Pacific Northwest, surrounded by spoiled kitties, deer, raccoons, and the biggest woodpeckers you've ever seen.